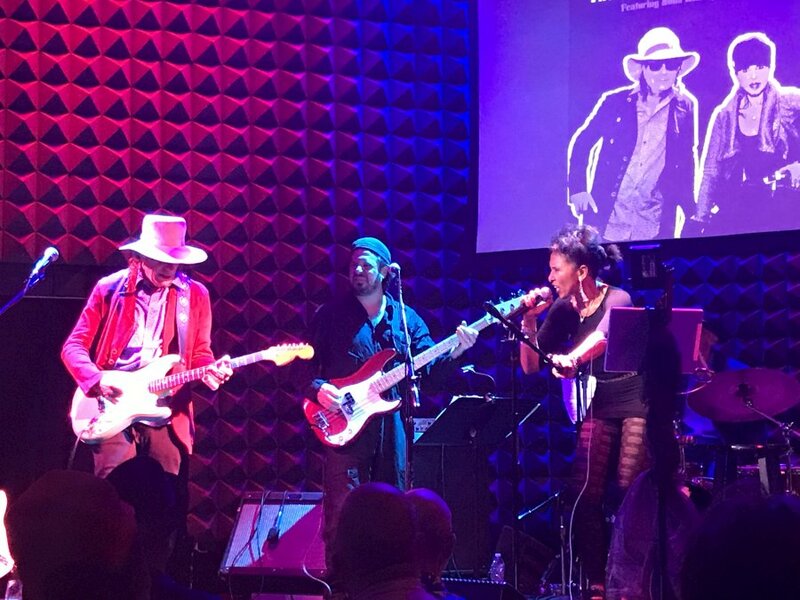 Just announced: April 25th at The Cutting Room, New York City, The World Of Captain Beefheart featuring Nona Hendryx and Gary Lucas with Jesse Krakow, Jordan Shapiro and Richard Dworkin performs, tickets available here! 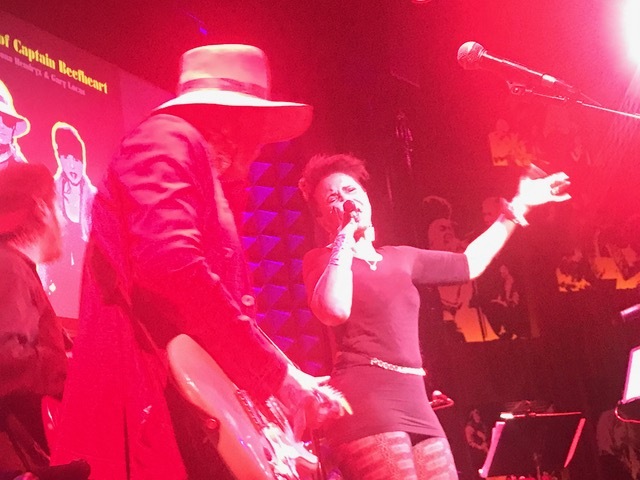 Gary's THE WORLD OF CAPTAIN BEEFHEART ensemble featuring Nona Hendryx gets an excellent live review for their recent City Winery NYC show in Manhattan Beat! 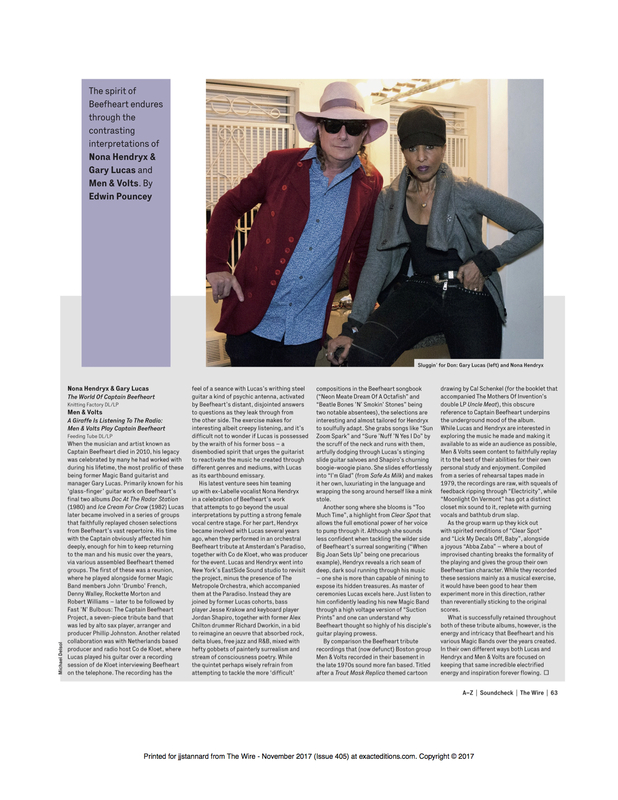 New interview with Gary about working with Don Van Vliet on NPR's Sound Opinions, and a rave review in High Times for Gary and Nona Hendryx's "The World of Captain Beefheart" album. 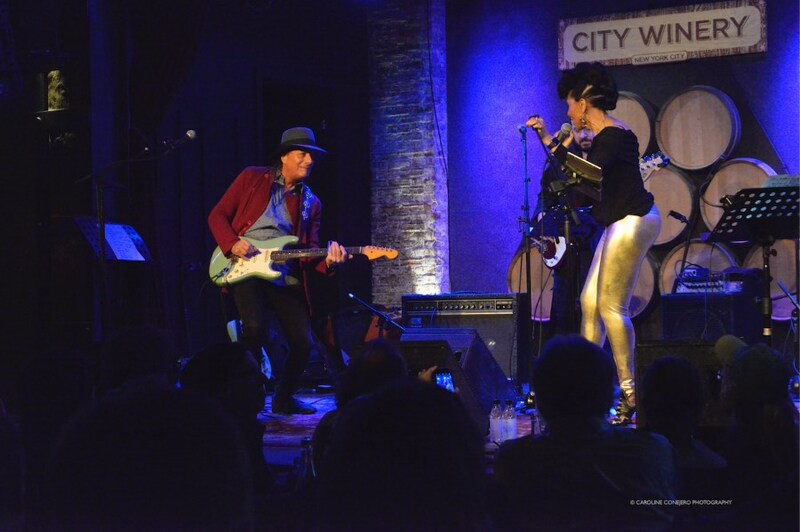 New album out now on Knitting Factory Records!! THE WORLD OF CAPTAIN BEEFHEART is the #4 Album of 2017 on KMUW, and the #4 LGBTQ album of 2017 in Hornet!! 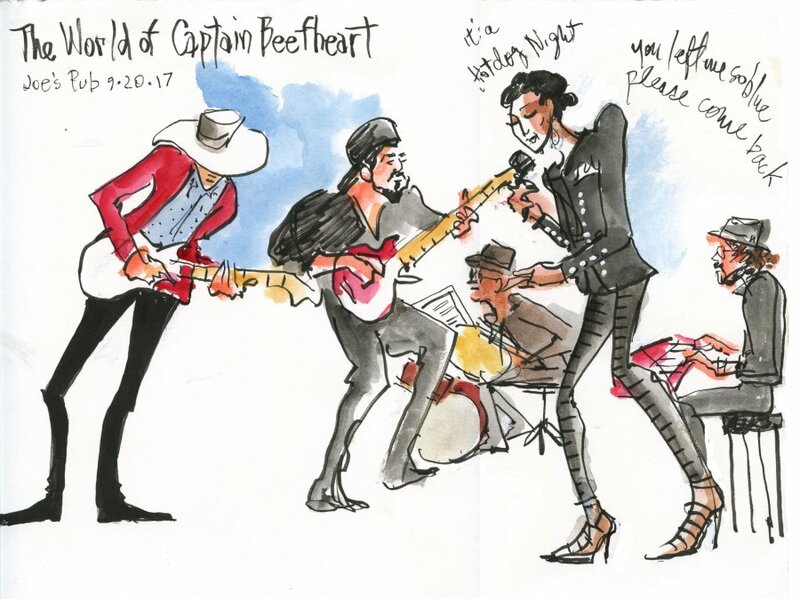 New "The World of Captain Beefheart" t-shirts and "The World of Captain Beefheart" CD now available! Check out rave reviews and articles in Goldmine Magazine, The Morton Report, The Wire The Rock and Roll Report, Dangerous Minds, The Village Voice, PopMatters (interview), PopMatters (review), The Vinyl District, Schizomusica, the Vancouver Sun, Songfacts, Stereo Embers Magazine, KMUW, Psychology Today, MOJO, Daggerzine, MOJO, Downtown Music Gallery, Beefheart.com, Black Grooves, United Mutations, The Morton Report, Please Kill Me, The Green Man Review, Ink19, Tomajazz (with podcast), All About Jazz, and the album received an A MINUS from Robert Christgau, "The Dean of American Rock Critics", in Noisey! 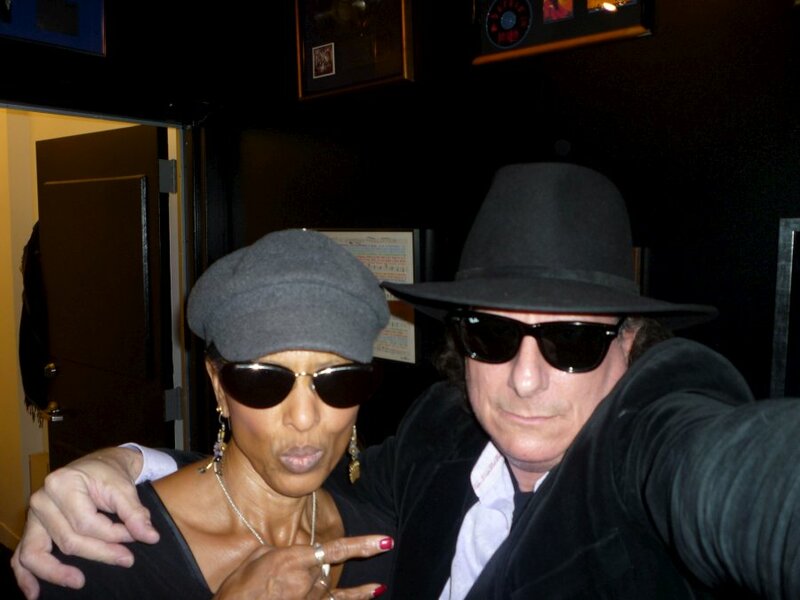 Check out a live session of The World of Captain Beefheart on Irene Trudel's WFMU show, and listen to Co De Kloet's show which features an interview and selections from our new WORLD OF CAPTAIN BEEFHEART album featuring Nona Hendryx on Knitting Factory Records—the segment begins at 19:18:44 with a blast from the past from our original symphonic Beefheart show at the Paradiso Amsterdam. 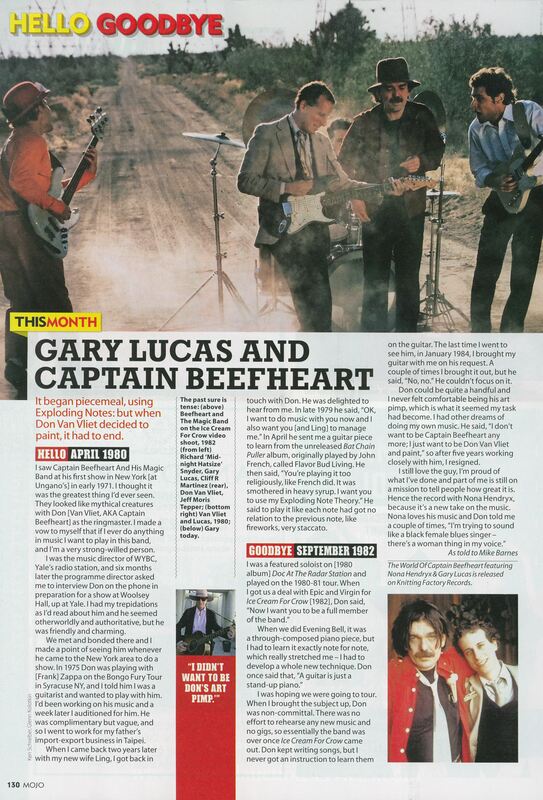 Gary is in the January 2018 issue of MOJO in a Hello and Goodbye feature article about his time with Captain Beefheart!! 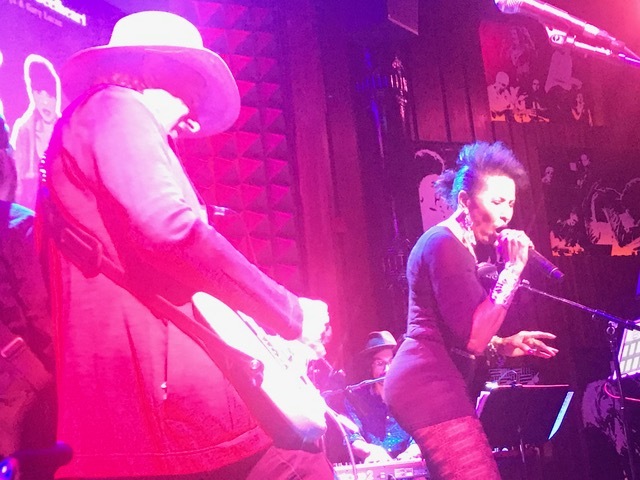 Read a rave advance review of the album from the Nashville Blues Society...and see a clip from YouTube taken by a fan at Gary and Nona Hendryx's sold out show with THE WORLD OF CAPTAIN BEEFHEART at Joe's Pub at the Public NYC on Sept. 20th. 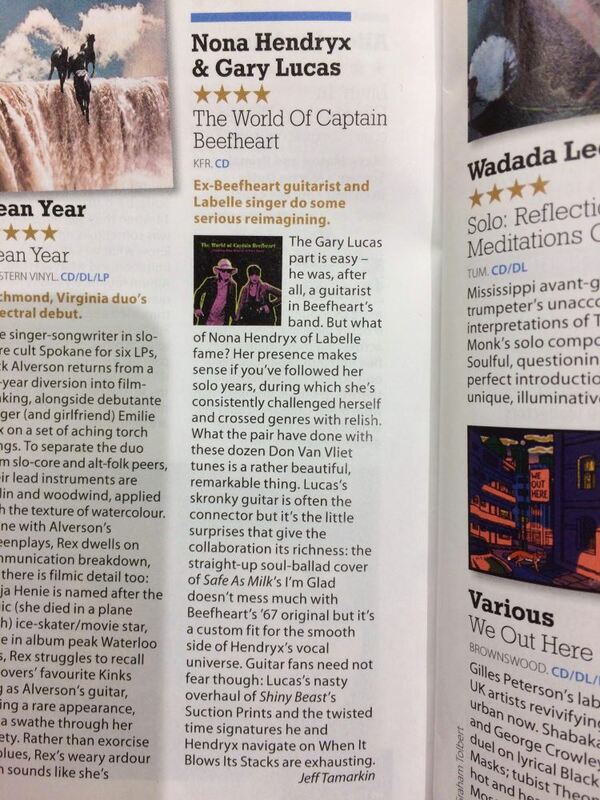 including jazz-rock ensemble Fast 'N' Bulbous, and his own one-man Captain Beefheart Symposium. 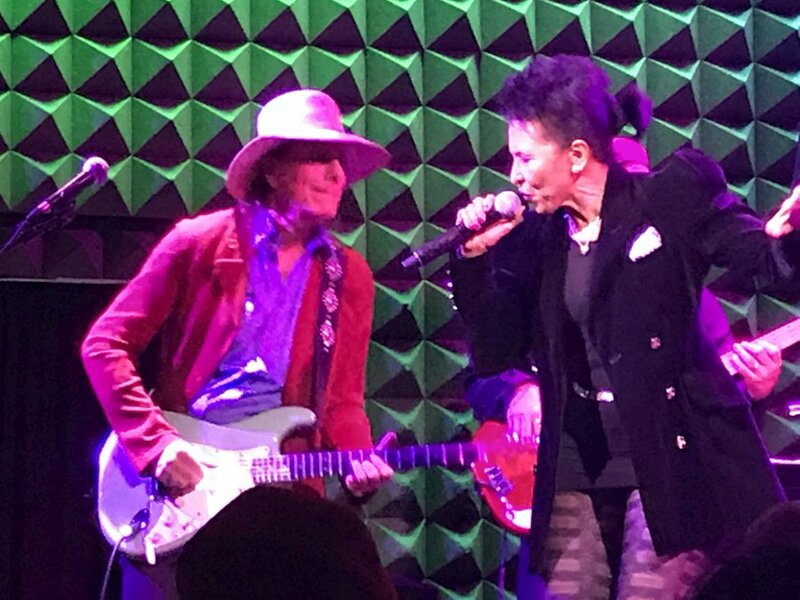 featuring GARY LUCAS and legendary soul icon NONA HENDRYX (Labelle) on vocals. 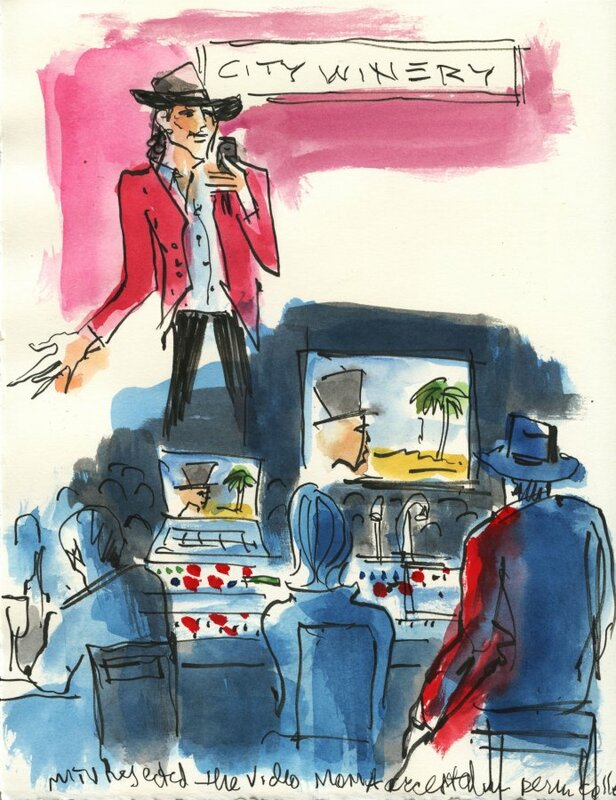 They've just recorded a new studio album that spans the entire length and breadth of Captain Beefheart's groundbreaking catalog, from "Safe as Milk" through "Trout Mask Replica" and beyond. 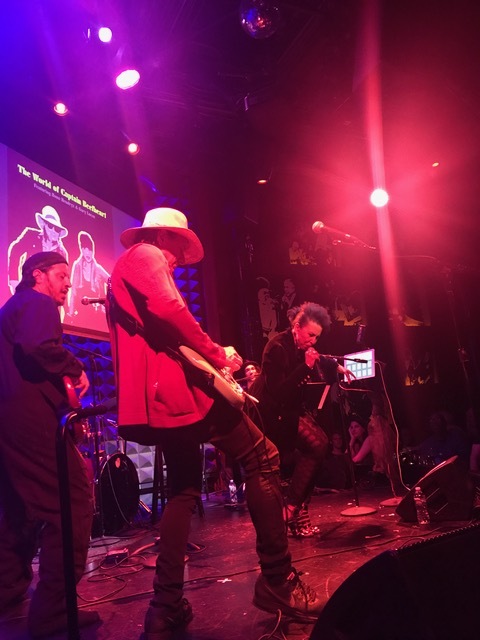 Also along for the wild ride are Fast 'N' Bulbous bassist Jesse Krakow, keyboard whiz Jordan Shapiro (Gods and Monsters), and drummer Richard Dworkin (Alex Chilton). 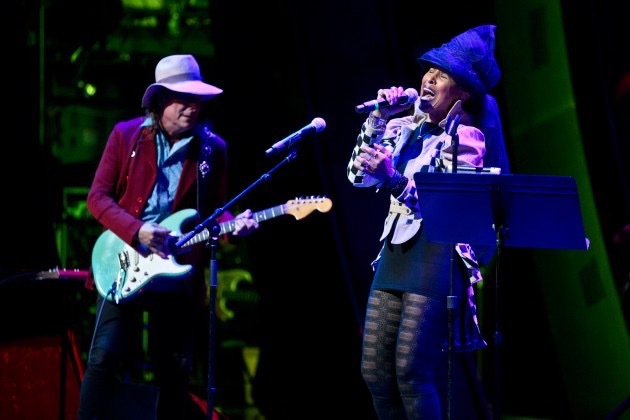 Together they cover the cream of Beefheart's wildly original synthesis of r&b, free jazz, rock and blues which spans his recorded entire output. 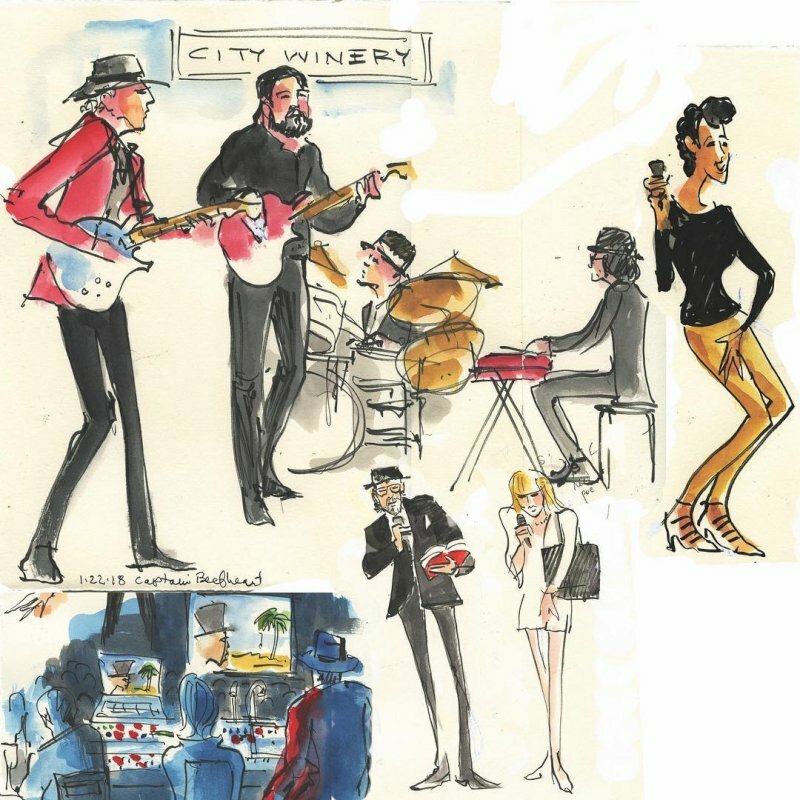 Happily, much of the group's repertoire is also found on the recent Captain Beefheart Box Set "Sun Zoom Spark", released Nov. 10th 2014 on Warner Brothers/Rhino!! 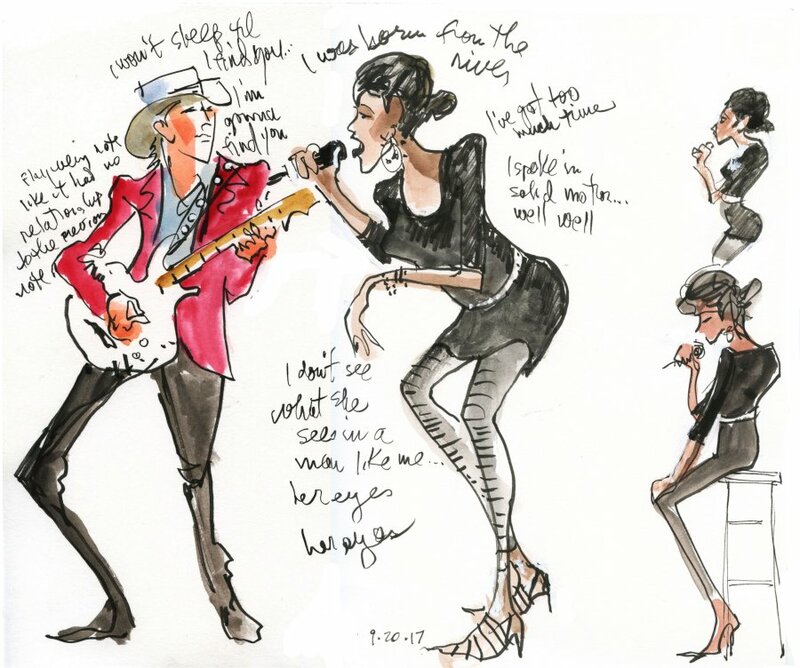 Gary and Nona first came together a few years ago in a big symphonic Beefheart tribute with The Metropole Orchestra at Amsterdam's Paradiso, produced by Co de Kloet. 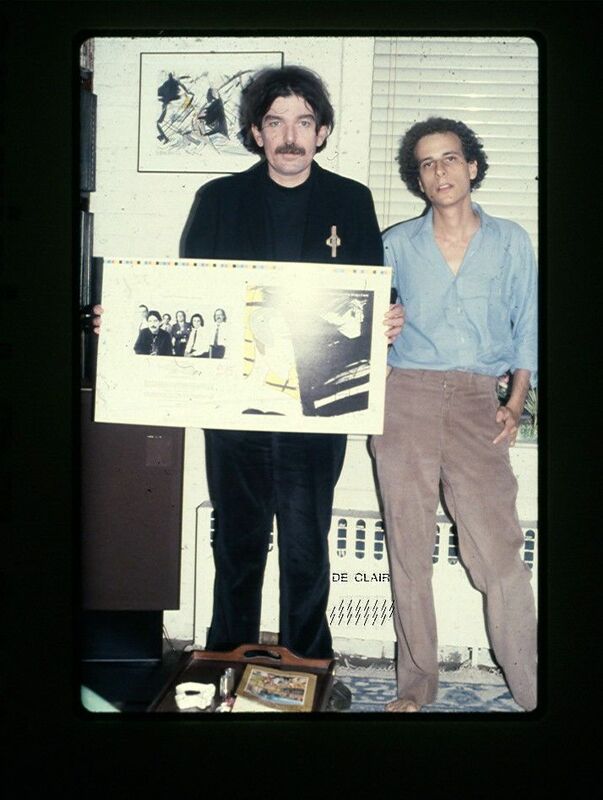 Now they're together again rocking out in a lean and mean Beefheart machine. "Sure 'Nuff 'N' Yes I Do"